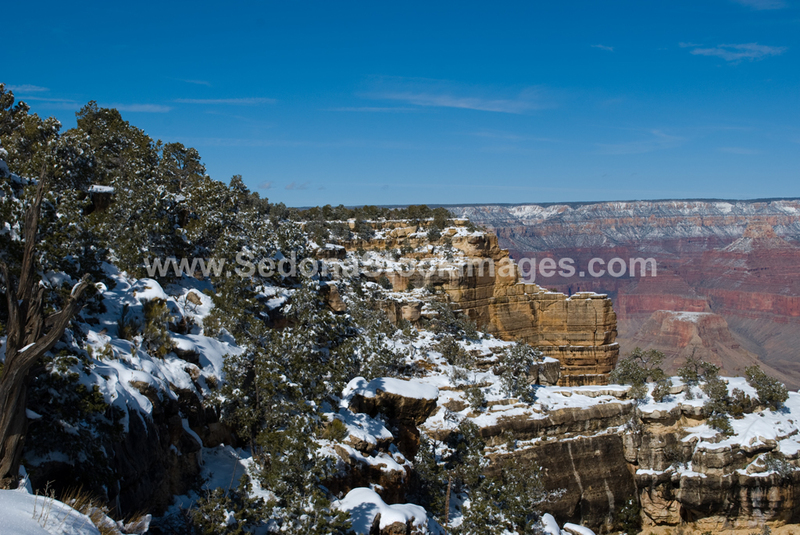 Photo ID: GCSnow2933.jpg South Rim of the Grand Canyon in winter. View from Trailview Overlook (6,860 ft high) showing the Grand Canyon's three top geologic layers: TOP LIGHT GRAY LAYER includes white Kaibab Formation (270 million years ago), gray Toroweap formation (273 m.y.a.) and yellow Coconino Sandstone (275 m.y.a. ); MIDDLE RED LAYER includes rust Hermit Shale Formation (280 m.y.a. ), pinkish red of the Supai Group (315-285 m.y.a.) and red Redwall Limestone (340 m.y.a. ); and, BOTTOM DARK GRAY LAYER includes light gray Temple Butte Formation (385 m.y.a. ), dark gray Muav Limestone (505 m.y.a.) and light gray Bright Angel Shale (515 m.y.a. ).